HARTFORD, Conn. – The three championship belts on display in the Murray State locker room this week offered an ode to coach Matt McMahon's love of the WWE. He so adores scripted wrestling that he'd call a friend every weeknight before “Monday Night Raw” to get fired up about the upcoming show. One of the thrills for McMahon this March came when he got to FaceTime with Ric Flair, his wrestling hero. And the basketball-loving public in America felt the same way about Ja Morant and the Racers in this NCAA tournament as McMahon does about the WWE. For 48 hours, McMahon's No. 12 Racers were the undisputed champions of the NCAA tournament after blowing out Marquette in the first round. Morant and his teammates introduced themselves to the general population with all the subtly of Flair leaping off the top rope. But on Saturday afternoon in Hartford, Morant's wizardry was overwhelmed by the physicality of No. 4 Florida State. The Seminoles bullied No. 12 Murray State out of the NCAA tournament, 90-62, hitting seven of their first 10 3-pointers and scoring with a persistent ease from both inside and out. 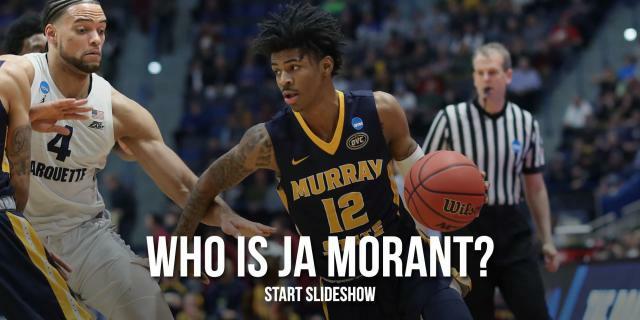 The loss for Murray meant the exit of the NCAA tournament's breakout star, as Morant captivated the country for two days in a similar way that Duke's Zion Williamson has riveted America the past two months. The NCAA tournament is a lonelier place without Morant, who proved such an intuitive passer, artistic scorer and unflappable floor leader that he's now the favorite to go No. 2 in the NBA draft behind Williamson. Morant finished with 28 points on 8-of-21 shooting and had plenty of highlights, but Murray State's inability to put up even a hint of defensive resistance left it scrambling for most of the game. Florida State shot 51.3 percent from the field in the first half to build a 16-point lead and finished 36-for-71 shooting in the game. 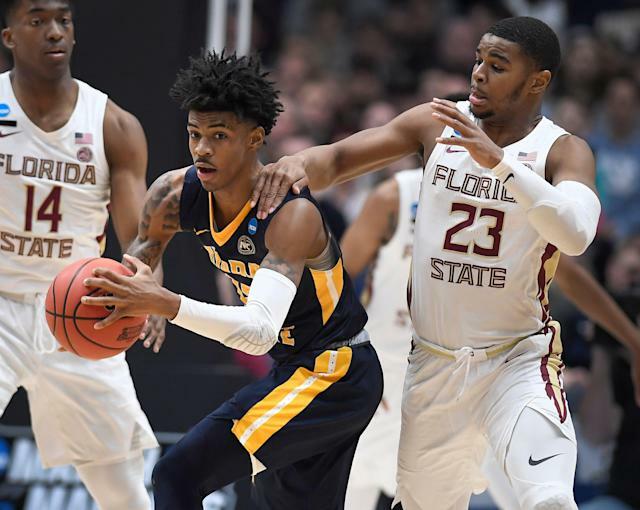 Murray State attempted to run with the Seminoles, which proved a crushing mistake that enabled FSU to score 50 first-half points and control the game. The game offered a collision of powerful and divergent storylines. For all the joy Morant brought to the NCAA tournament, Florida State entered the game inspired by something bigger than basketball. The players on No. 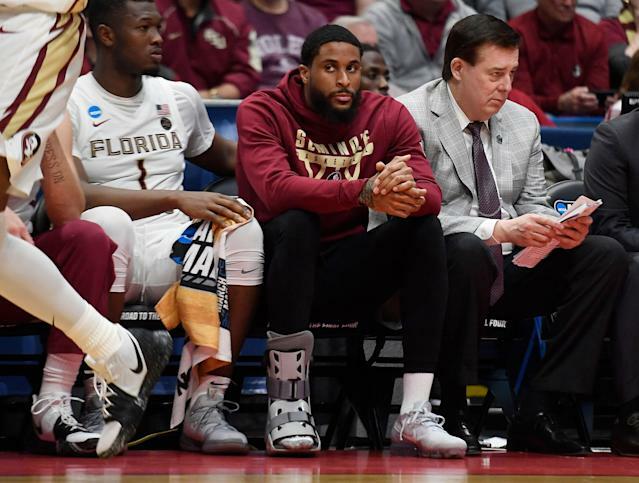 4 Florida State vowed to play for their injured teammate, senior Phil Cofer, who found out in the locker room on Thursday that his father died. FSU played aggressive and connected all game, as three players finished the first half in double digits (RaiQuan Gray, Terance Mann and Mfiondu Kabengele), and Kabengele led the Seminoles with 22 points. The Seminoles’ ultimate muscle flex came from showcasing their depth while scoring 23 bench points in the first half and playing 10 players. Murray finished the first half with no bench points, as basically FSU swallowed the Racers whole with their superior size, athleticism and speed. Florida State advances to the Sweet 16 for the second consecutive year. The Seminoles are doing their best to reverse coach Leonard Hamilton's reputation as a tortured postseason coach — he's lost to a lower seed in the NCAA tournament six times in his career. FSU again relished the role of physical enforcer on Saturday, blowing out the Racers in what's widely expected to be Morant's last college game. Morant performed in such a way that showed NBA fan bases in places like New York, Phoenix and Cleveland there’s a player other than Zion to pine for. There were moments of hope and promise early for Morant and the Racers. Morant sparkled in the first half, hitting the first five 3-point attempts he took. He even managed to electrify the crowd during a dead ball, as he threw the ball off the backboard after a whistle and mimicked the motions of an alley-oop to himself. The Racers got blitzed early and never recovered. And for basketball fans, the NCAA tournament became a little bit less fun. Murray State handed over its metaphorical championship belts to FSU, which was the undisputed better team on Saturday night.